When they were released in 2004, the ADP Benchmarks reflected an unprecedented convergence in what employers and postsecondary faculty say are needed for new employees and for freshmen entering credit-bearing coursework to be successful. Beginning in 2001, the American Diploma Project commissioned leading economists to examine labor market projections for the most promising jobs—those that pay enough to support a small family and provide real potential for career advancement—to pinpoint the academic knowledge and skills required for success in those occupations. Achieve then surveyed officials from 22 occupations, ranging from manufacturing to financial services, about the skills they believe are most useful for their employees to bring to the job. Following those conversations, Achieve worked closely with two- and four-year postsecondary leaders in the partner states to determine the prerequisite English and mathematics knowledge and skills required for success in entry-level, credit-bearing courses in English, mathematics, the sciences, and the humanities. 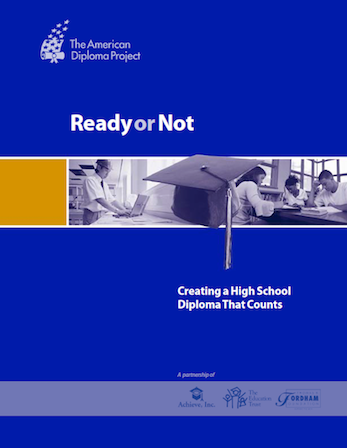 The resulting ADP Benchmarks - published in Ready or Not: Creating a High School Diploma that Counts - reflected an unprecedented convergence in what these employers and postsecondary faculty say are needed for new employees and for freshmen entering credit-bearing coursework to be successful. Today, they stand as the pre-cursor to the Common Core State Standards.